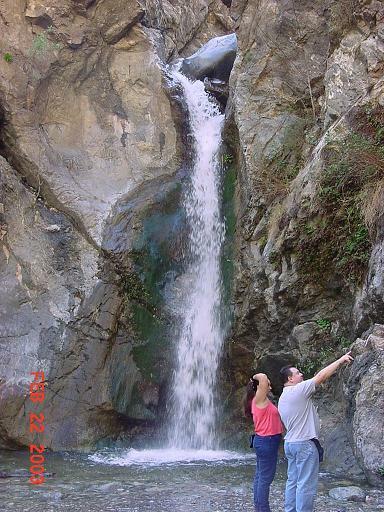 Jason Maston at Eaton Canyon Falls. 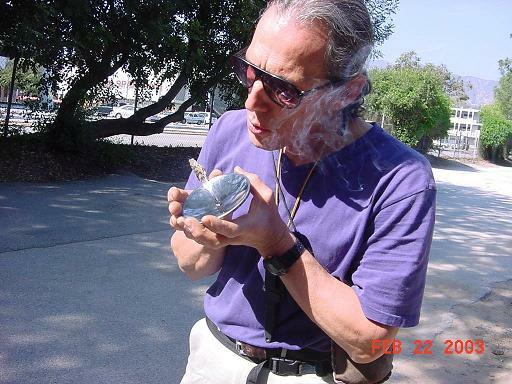 Christopher Nyerges is always finding new uses for mugwort. 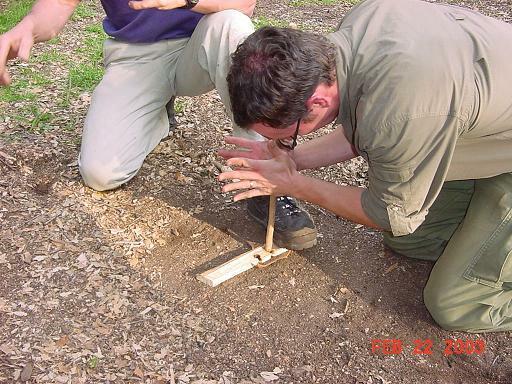 Here he starts a fire using a solar cigarette lighter! 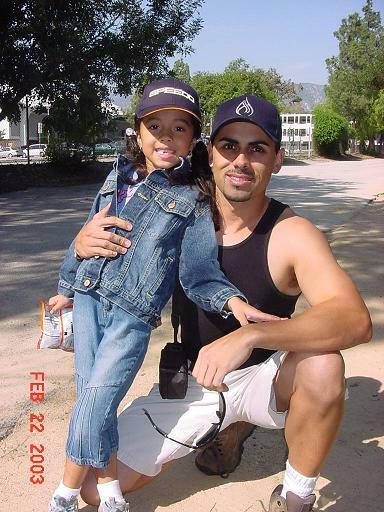 Alan Halcon and his daughter Jalene also attended Christopher's class. "JJ" was very shy...for about 20 seconds! We went foraging. 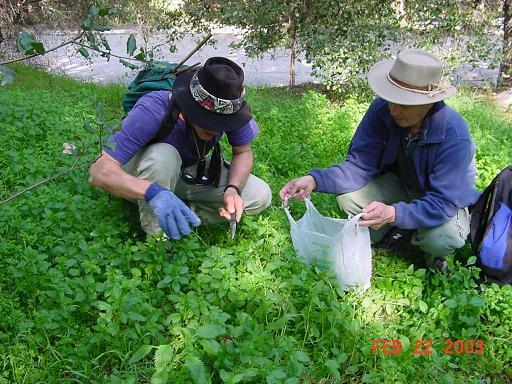 Christopher and Gary collect nettles. Note the gloves! When cooked, its texture and taste resemble spinach. You have to gather quite a bit as it cooks down like spinach. All of us thought it actually tasted better than spinach. 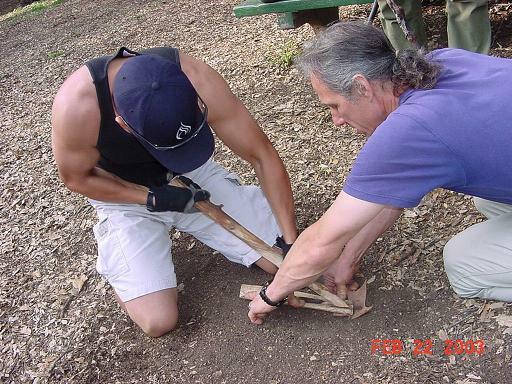 Christopher and Alan attempt fire with the fire plow. Jason tries the fire plow. They were using willow on willow. I think they would have been successful with a better wood, such as cottonwood. 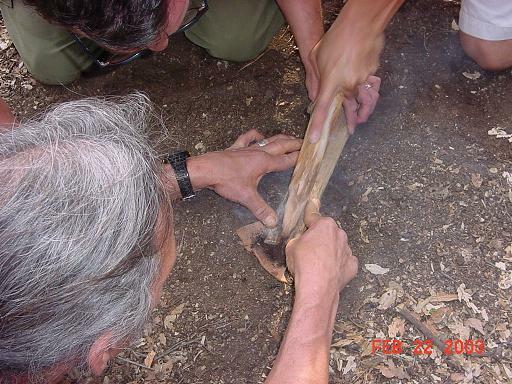 A team effort produced an ember with the hand drill in no time at all. 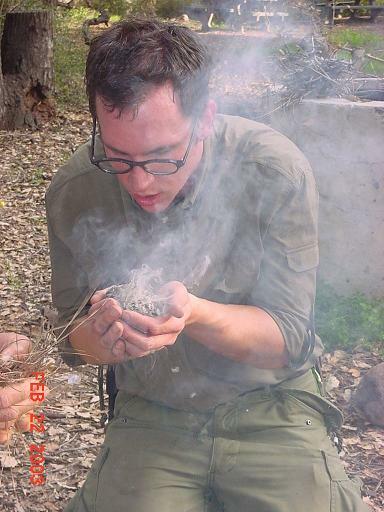 Jason blows the ember from the hand drill into a flame. Time to prepare dinner. Christopher brought some foods collected on other trips. 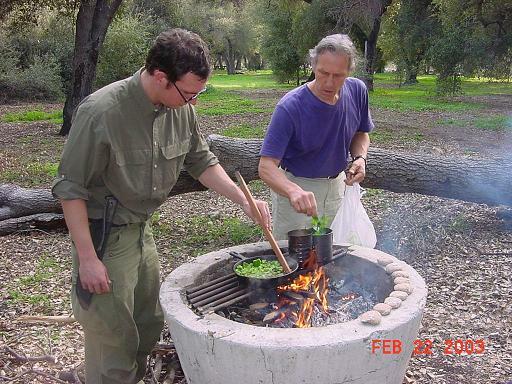 Here Jason cooks diced prickly pear cactus (prior to adding eggs) while Christopher cooks the nettles. Biscuits made from half pancake mix and half acorn meal line the rim of the fire pit. After the class, Jason gave me a ride to the trailhead. He would join me for the first night of my hike. We spent the evening at Gould Mesa. Sunday morning I continued my hike alone. 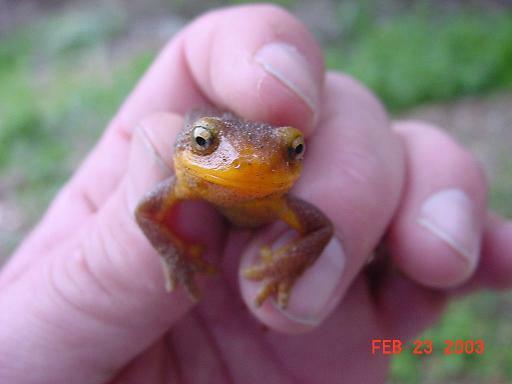 This was the first of several salamanders I saw during my trek. 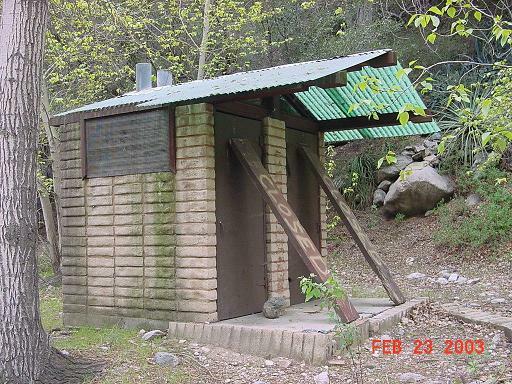 This is the restroom at Paul Little Picnic Site. 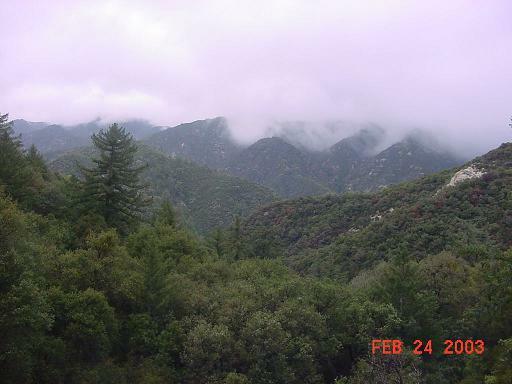 I think it is disgraceful that the U.S. Forest Service spends so little on maintenance. Those in charge should be ashamed. I hiked past Oakwilde Campground. 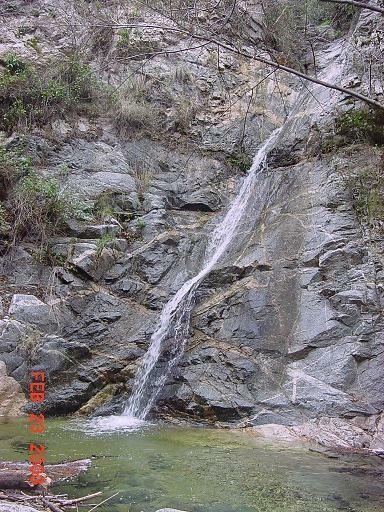 Here is a shot of the waterfall where Long Canyon meets the Arroyo Seco. You can't tell from this picture, but the falls is about 25 feet high. 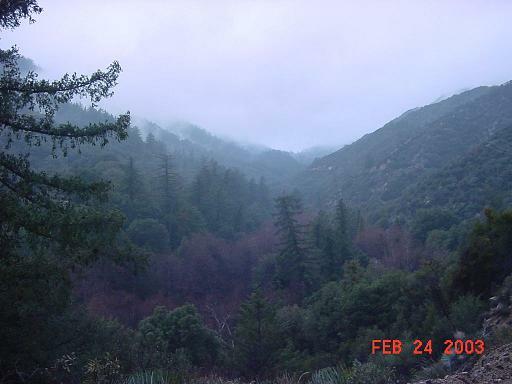 I left the Gabrielino Trail and was on my way down to Switzer Falls when I heard a helicopter approach. Definitely not just a fly over. I went back up to see what was happening. 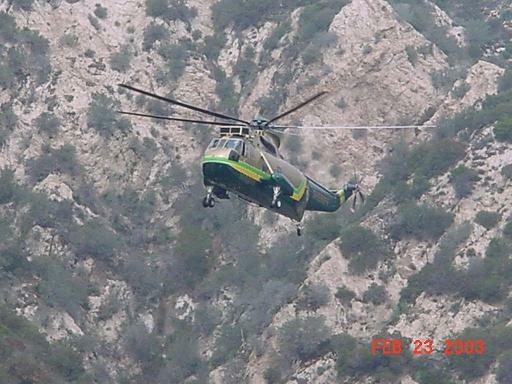 They were rescueing a hiker who had broken his leg. Go here to read about the rescue. 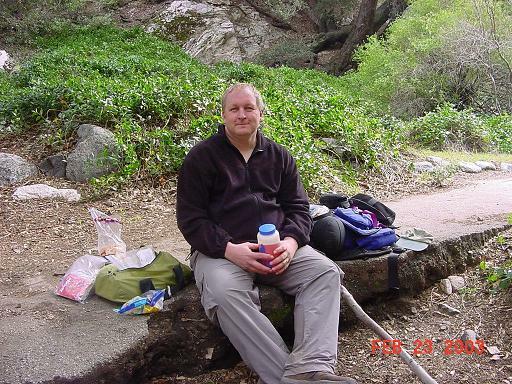 I took a much needed lunch and liquids break at Switzer trail camp. Lunch at Switzer trail camp. The trail from Switzer trail camp to Switzer picnic area was very crowded - lots of families enjoying a day in the mountain. Beyond Switzer picnic area the crowds really thinned. At this point I have been walking mostly uphill for almost eleven miles. I am starting to get tired. And lonely. The dreary skies below Red Box Station did little to cheer me in my tired state. I reached Red Box Station at about 3pm. 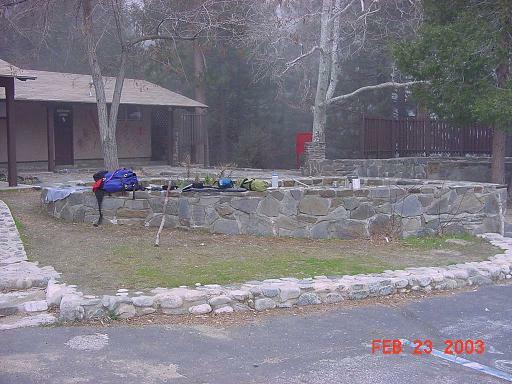 Yet another closed U.S. Forest Service station. Shameful. There is a pay phone here so I called my sister to let her know where I was and that I was OK. I cooked dinner here, then continued on to Valley Forge campground. I reached Valley Forge after dark. I used the fire road instead of the trail so I would be able to see. Still, I needed a flashlight to find my way. 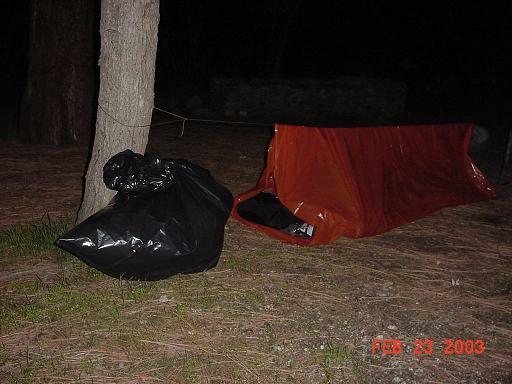 I set up my tube tent and put my pack in a large trash bag in anticipation of rain. I hiked 14.5 miles today. 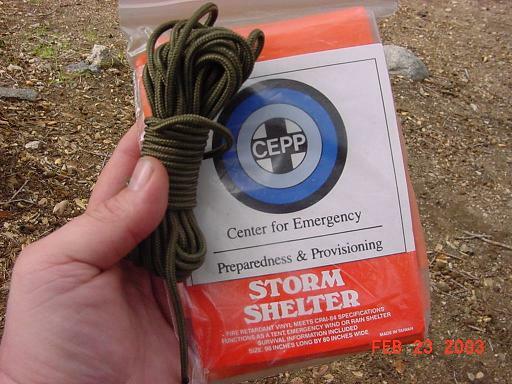 This is the tube tent I used. Not a wise choice. Yes, it is better than nothing, and will certainly keep you alive. But this particular brand is very small, so there was a lot of condensation. The outside of my sleeping bag was very damp the next morning. It didn't rain that night, but started to rain just as I finished packing up. I decided to take the road to West Fork rather than the trail as I thought it would be more scenic. (I would have chosen the trail in the summer as it would be more shady.) Here is the view back towards Red Box Station. 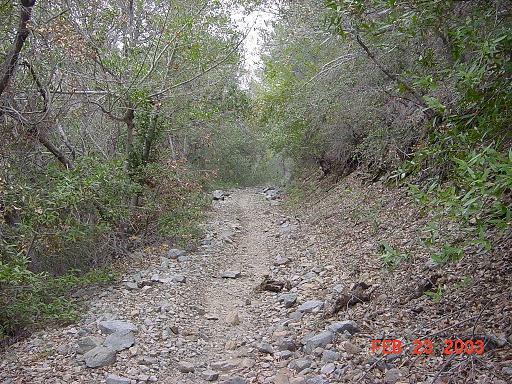 The trail from West Fork campground to Devore trail camp was much easier than I remember. Still, there were plenty of stream crossings. 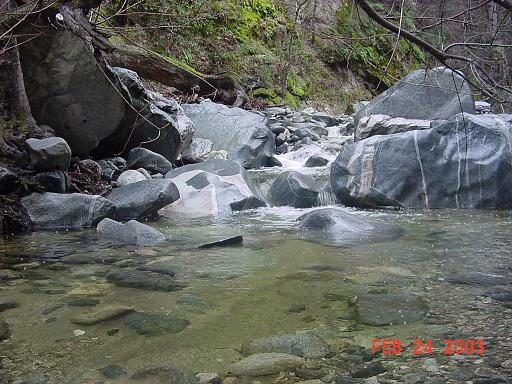 The creek is beautiful here, as are most of the creeks in the San Gabriels. The climb from Devore trail camp to Newcombs Pass is a tough one. 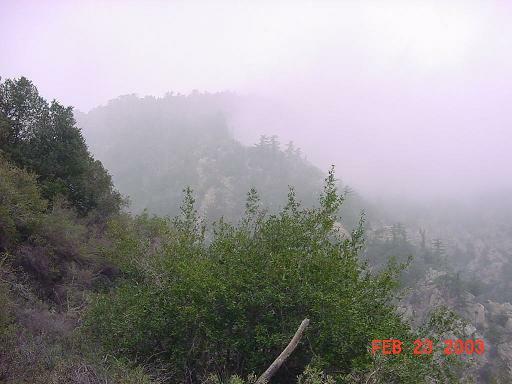 Here is a photo of the view about 2/3 of the way up. Just below Newcomb Pass (elev. 4115'), my first glimpse of the L.A. basin area. 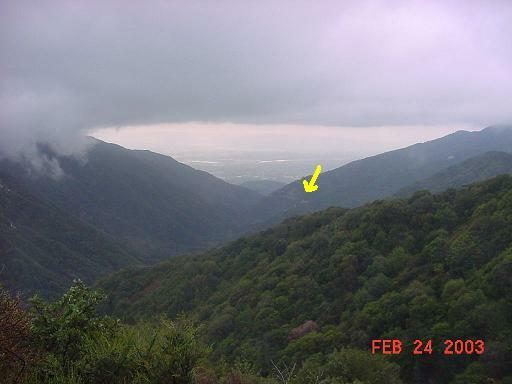 The arrow points to Chantry Flats, 6.2 trail miles away. By the time I reached Spruce Grove I was very wet - on top from sweat and on bottom from brushing up against plants along the trail. The trail from Spruce Grove to Chantry Flats had a lot of miners lettuce. 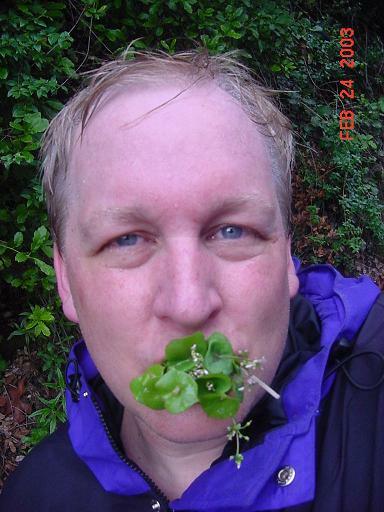 Miners lettuce is delicious! 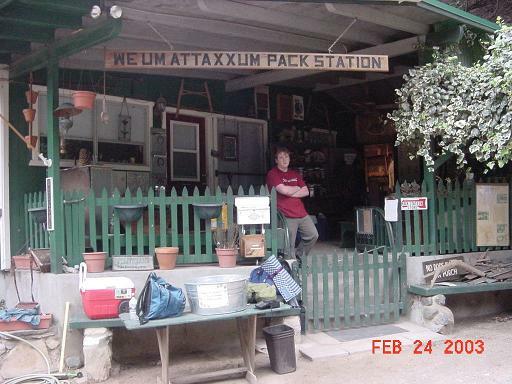 This is Patrick at the pack station at Chantry Flats. He was nice enough to open the store for me. I bought a souvenir bandana and a couple of sodas. 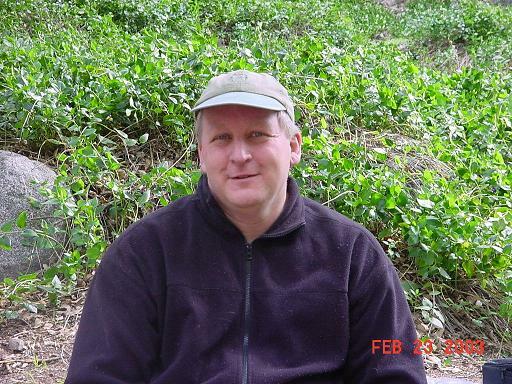 I had hiked 11.5 miles, completing the Gabrielino National Recreation Trail. 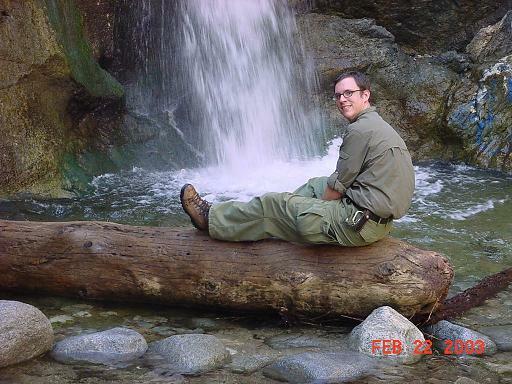 Copyright © 2003 by Bill Qualls. 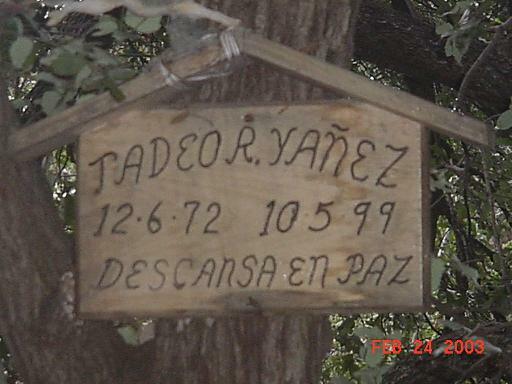 Last updated February 25, 2003.